Black Friday has always been a day to go out and go shopping. 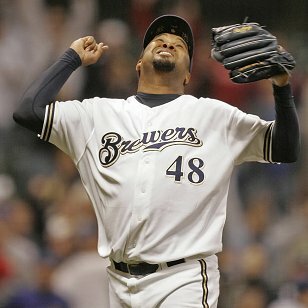 Four years and $46 million dollars to land the top free-agent closer on the market, Francisco Cordero. The Cincinnati Reds have searched for years; since the late 90’s to find a dominant closer. I remember in 1998 it was Scott Williamson (NL ROY, Power Closer) and Danny Graves who fueled the Reds run to a near wild card berth. Now it appears the Reds have a horse to really go out and anchor their bullpen. No one can say that this Reds ownership group headed by Bob Castellini is tight; or that what is needed to spent isn’t being spent. This is clearly a bookend signing that will allow the Reds a player who will anchor their bullpen for years to come. Cordero is 32 but at an age where he still throws gas. His 44 saves last season in Milwaukee were the second most of his 9 year career. It wasn’t like Milwaukee didn’t wanna keep this guy; he was reportedly offered 4 years, $42 million dollars to stay in Milwaukee. This is a time when I am glad the player spurned an offer to go with the highest bidder, and props to the Reds for taking yet another step in the right direction to becoming a contender.